Café Amigos has been around the corner for a long time now and yet no one told us about these amazing shakes that they have on the menu! Think paan shake or think mud-pie shake and you will find them all in their menu here. They have some unique and awesome options such as rajbhog, mango-lychee, cookie strawberry, chunky monkey, and much more. The shakes all come at a price range of INR 150-200 and are delicious. Thick but light and so refreshing, we loved what we had. The flavours are bang-on and we couldn’t help but smile after every sip. Not only are the shakes good, the food is lip-smacking too. 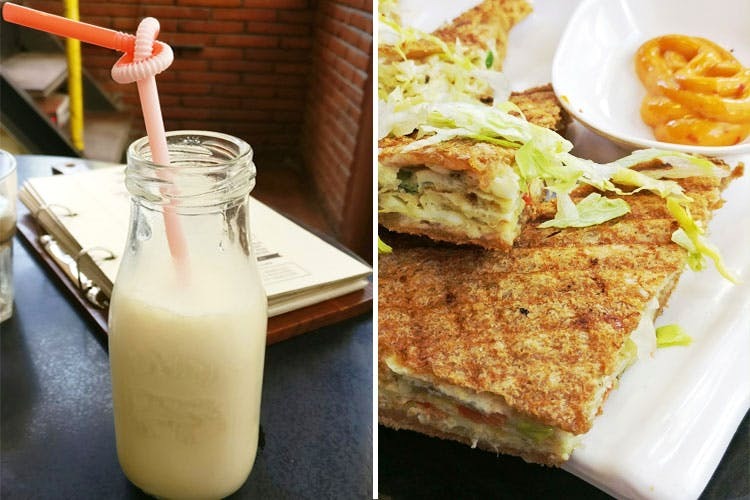 Try the veg melting sandwich or the egg omelette sandwich and the pasta options. We can only think of one word to describe them- delicious. Amigos opens at 8am with a breakfast menu that is served until 11 am. There is a lot of parking space around, so that is not an issue. The café is generally packed later in the day. The next time you are craving a delicious cool treat or yummy food, head to Café Amigos in Thane and satiate those hunger-pangs.